Is it age I wonder? Besides the ripping back I have also managed to get quite far on the various projects which I set out for myself this week. Let me show you what I have been up to. On Saturday I was thrilled to finally get on with some weaving. 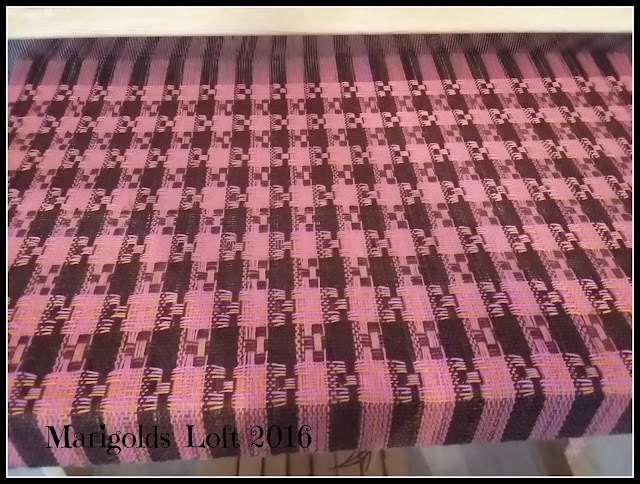 This warp is for the Danish towel pattern of Handwoven (May/June 2015) which I warped around the same time as the magazine came out last year. 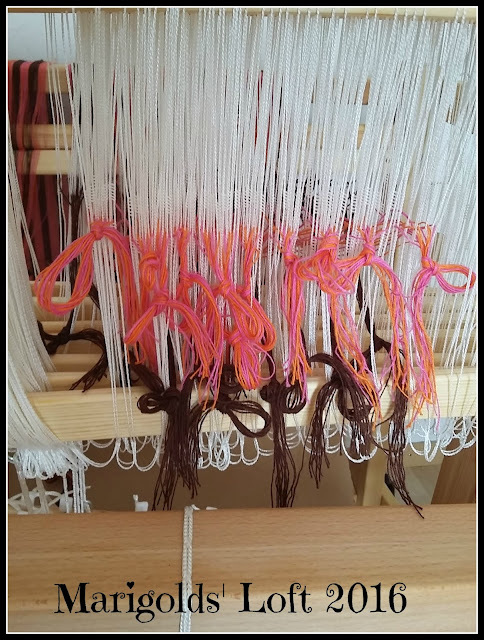 When I came to the end of the warp whilst dressing my loom, I noticed that I had 4 threads too many and I figured that I had wanted to make a strengthened selvage, but as I no longer saw the need I left those threads out of the warp and merrily began my pattern. 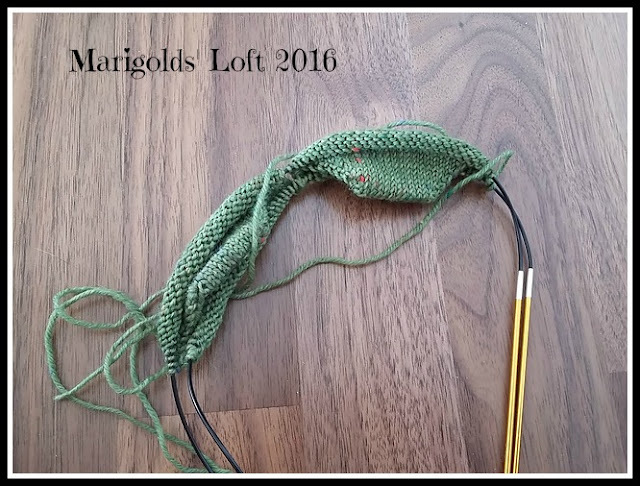 Whilst weaving, I did keep going back to the image in the magazine and wondering why my pattern wasn't looking the same - similar - but not the same, but I put it down to being too close to the warp and thought as soon as I stood away from the loom things would look a lot different. Well, it was a pity I didn't stand up earlier, as when I did stand up I realized the problem. My pattern was off by 4 threads......funny, I had removed an extra 4 from the left side of the warp before I began......then it hit me! Obviously the selvage occurs on both sides - DUH, and since I had only removed the extra left hand selvage threads, I had not considered that I had had any extras when I began to dress my loom and so I merrily programmed a 4 thread mistake into my lovely warp! 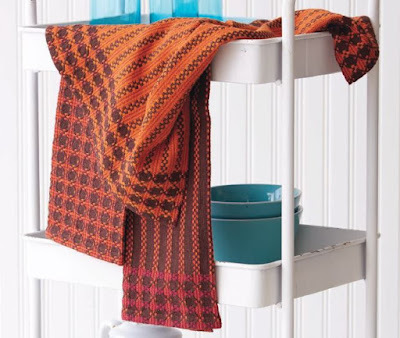 I cut off my already woven cloth and have since begun again to re-dress my loom! I hope to show you some better progress with this project next week though! 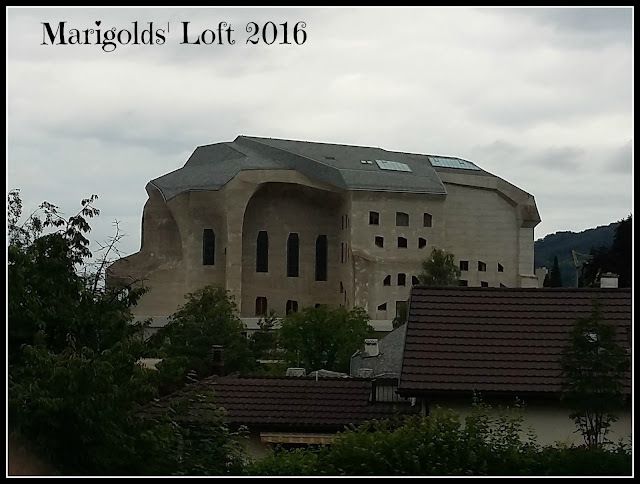 Last week I had the pleasure of visiting the Goetheanum in Dornach, Switzerland. This is the world seat for the anthroposophical society and was designed by Rudolf Steiner. If you ever get the chance to visit this incredible build, I would warmly recommend that you do. Having my children in the Waldorf school and working in an anthroposophical institution did definitely benefit me to "Understand" the building a little better. On my way there I managed to get a little work done on my Fine and Dandy socks, which are another interim pattern for this year's Sock-Along. These are being knit up in Spinnwebstube Yarn and I love how they are turning out! 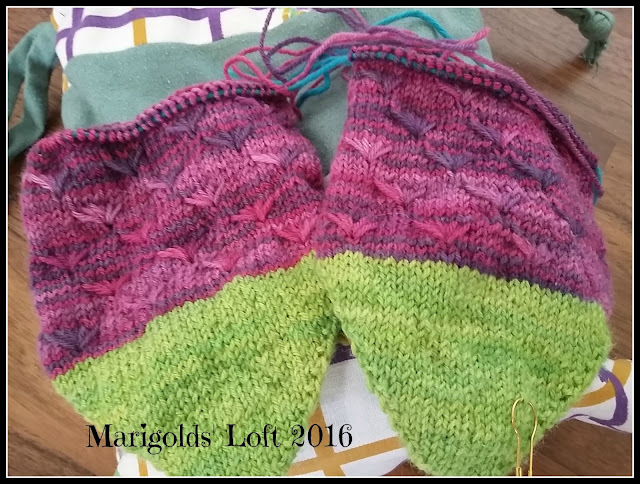 I may need to spice things up a little with this pair as I only have 50g of the pink, and 50g of the green, so it most likely won't be enough for a decent length sock.....I will think of something. This is my official pair of socks for the month of July. I actually wanted to be a bit further for today (well, I already was) but I had to rip these back down to their toes as I had merrily continued in pattern on both sides of the foot! Next week, there will definitely be a little more progress on these! Once I had unpacked them though, I knew if would be the blue - and I think Lyanna Stark is more of a blue don't you? Sewing: My tunic is just about done, I have to hem the tunic and the sleeves and I do hope I get a chance to do this sometime this week. I have another FO in sewing that I will be sharing with you all on Friday. 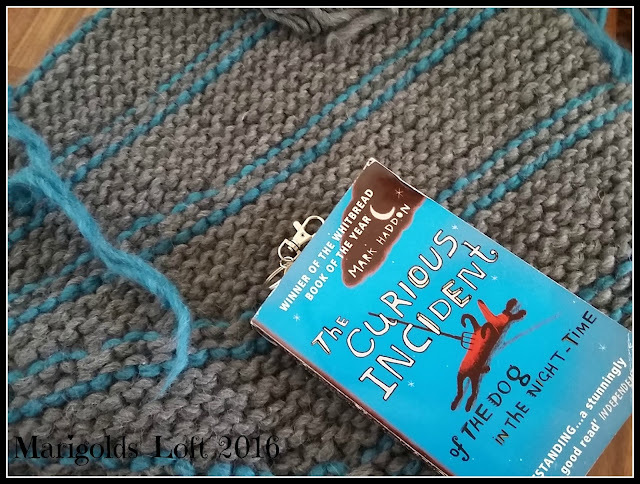 Reading: I have finally gone on to a new title - The Curious Incident of the Dog in the Night-Time, and I am loving this book so far. Ohh.....The cat basket is just about done too - and I just may have enough yarn, hold thumbs that this is the case! I will be sharing this post with all of my creative weekly friends so do drop by there for some super inspiration! Beautiful weaving!! Wow! 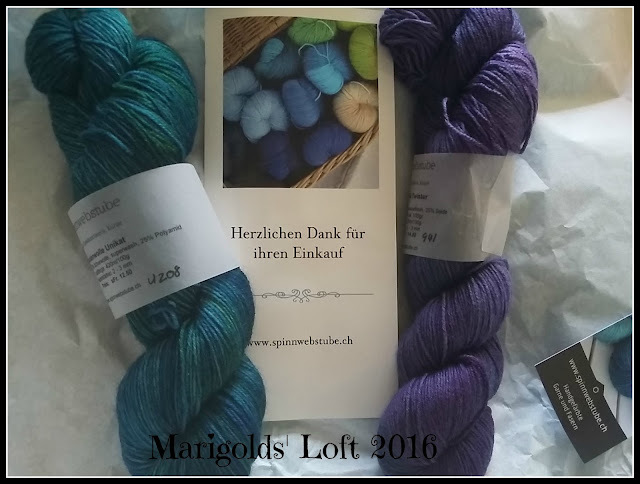 And, all those socks - I am in awe of two socks at a time on the same needle! Bravo to you! Wow! You have been busy with more beautiful projects. Thanks for sharing.